other cams have arrow keys + wheel. I think both the wheel and keys have to work it, they do right now. i like the graying of things not working in whatever mode. just have to make sure the reasons are right so we don't really disable a feature that will actually work. Using uncacheable BMP VRAM (see bmp_vram()) will fix that (but it will draw slower, so probably negates the dma copy advantage). Worth running some benchmarks. not everything needs autoiso off. I've counted 3 things, and I'm sure I've missed some. I'm thinking to add a callback to check dependencies, instead the MNI_WARNING icon hack. i like the graying of things not working in whatever mode. just have to make sure the reasons are right so we don't really disable a feature that will actually work. Sure, that's why I've introduced 2 levels of warnings: first will gray out the feature (meaning it won't work at all), and the second will just display some advice (e.g. intervalometer works best in photo mode... but if you want to enable it in movie mode, it will still work; but for bulb ramping, you really need to go to photo mode => intervalometer is not grayed out, but ramping is). @stevefal I like the design of your submenu. It looks cleaner and doesn't change size depending on the entries. In my opinion fast and easy editing of features should have priority. If we go for full-screen submenu, it may not be obvious that submenu items are using a different keybinding (left-right: toggle values). More stuff on the repo: icons removed, ON/OFF labels dimmed, colon erased (really dirty implementation, but it's just enough to try the concept without breaking the entire codebase). In menu.c, define CONFIG_MENU_ICONS and undefine CONFIG_MENU_DIM_HACKS to go back to the old style (icons, colons and no dimming). *I'm serious, it looks dead boring now. This only applies to the Icons of course. Otherwise I love the stuff discussed here! Okay, a bit more constructive. Together with A1ex we tested a few ways to solve this. You see three screenshots, whereas the first one is the discussed one, without icons and grayed entries. The second one, my favourite with only grayed entries. The last one is pretty much the original. I think main and submenus should look and work the same, as much as possible. I think folks will get used to more emptiness. I like it. What do people really get out of the icons? Well its not compiling yet, probably cause a1ex isn't done. getting rid of the reverse toggles might drop binary size some but now i have to rewrite the 600D build and its bitrate.c and hope the pulls don't eat a bunch of functions. It's quite easy to rewrite the reverse toggle: if (delta < 0) call the reverse func. I did that in audio.c. What error are you getting? 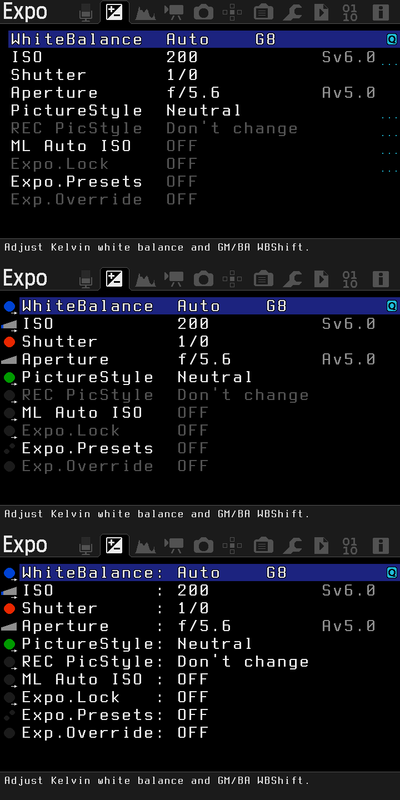 Here it compiles fine on all cameras from nightly repo, with the default feature set. I have to upgrade gcc, found it in an earlier commit. *I'll go by what you did on how to fix it but still a pita... oh well its for the best. kinda itching to know how much if any size got saved. Everyone relies on visual feedback! Can you please describe, in priority order, any specific elements of information that you rely on from the icons? 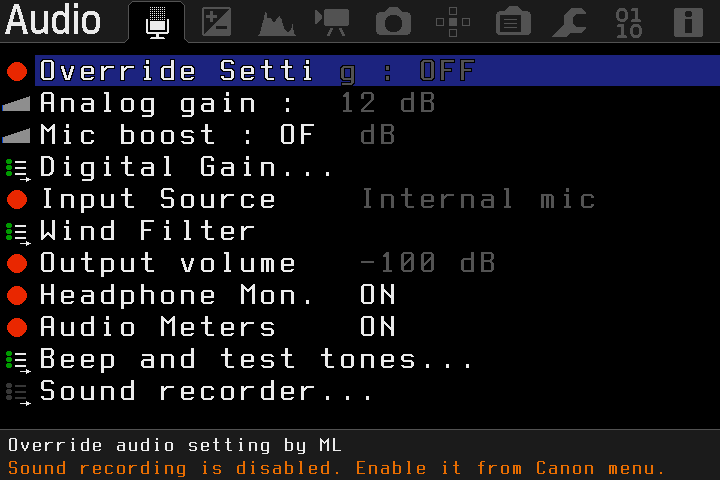 well 600D audio is broken now. the values jump aroun. ie internal mic is gray. 12db is last and gray on analog gain. 6d crashes from beep.c task on memor.c... maybe from shoot_malloc small or dma copy... i dunno but both worked yesterday. playback also crashes from the same thing and sometimes the menu. Graying is not exact, ignore it for now. Whenever a value is zero, the menu code thinks it's off and grays it. Disable CONFIG_MENU_DIM_HACKS and should be OK.
Can you show a screenshot with what's wrong? I'll give the left side icons a go.. The menus are not aligned, the ":" should stay on the same column for all items. This is what's causing the bug. The ":" is now erased the hard way, and its position is hardcoded. To implement it cleanly, I need to rewrite all the display functions. Disable CONFIG_MENU_DIM_HACKS and should be OK.
ok, works without the dim hacks. still says off db tho.